Access the lyrics and tunes to over 20 Christmas classics at the touch of an iPhone. The recently released Christmas Carol Lyrics application displays the words to 22 seasonal favorites such as Deck the Halls, Joy to the World, and Jingle Bells. Users can scroll through each verse and sing along as the application plays classic organ renditions of the tune. Whether caroling the neighborhood or driving to Grandma’s house it’s the perfect application for spreading on-the-go Christmas cheer. “I noticed my friends knew the first lines of each carol and then resorted to humming. I wanted to create an easy app to keep people singing their yuletide favorites,” said designer Ed Williams. Five animated backgrounds, including trumpeting angels and Santa’s soaring sleigh, offer festive visuals to match the Christmas motif. 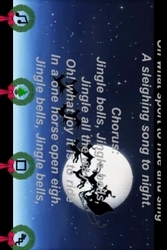 Users can even remove the lyrical displays and simply enjoy the sights and sounds of the season. Excelltech has designed over 30 applications for the iPhone as well as several titles for the Blackberry and Android platforms. The company is dedicated to utilizing mobile technology to deliver useful innovations and entertaining diversions. For more information on Excelltech please contact excelltechmobile (at) gmail.com.